The woe being felt, due to the lack of a traditional American Halloween, was slightly alleviated by the observation of All Saints Day. Originating in the 700s CE, the Church decided that November 1st shall be the day to honor all of the saints that did not have their own day. 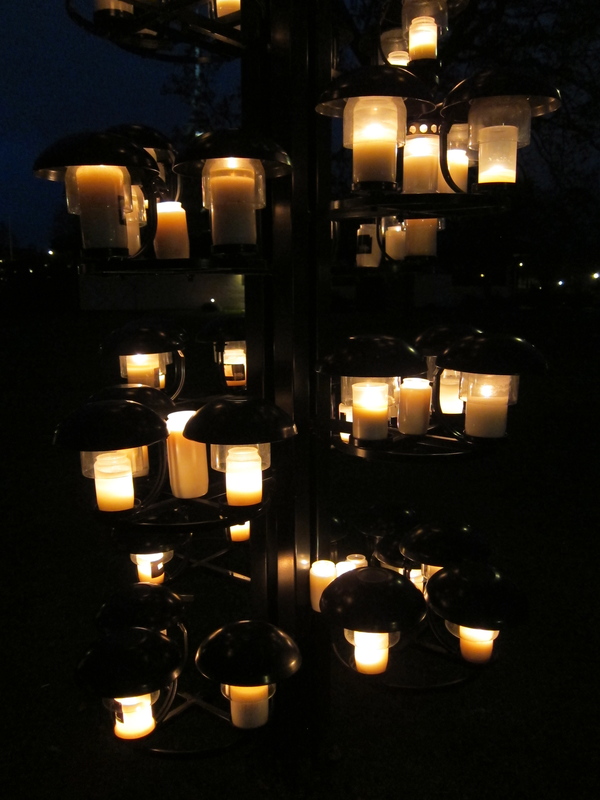 A couple of hundred years later November 2nd was to honor all non-saintly defined deceased individuals, known as All Souls Day. Now, the two have merged and is observed on the Saturday between October 31 and November 6th. Being new to this holiday, we didn’t know what to expect. 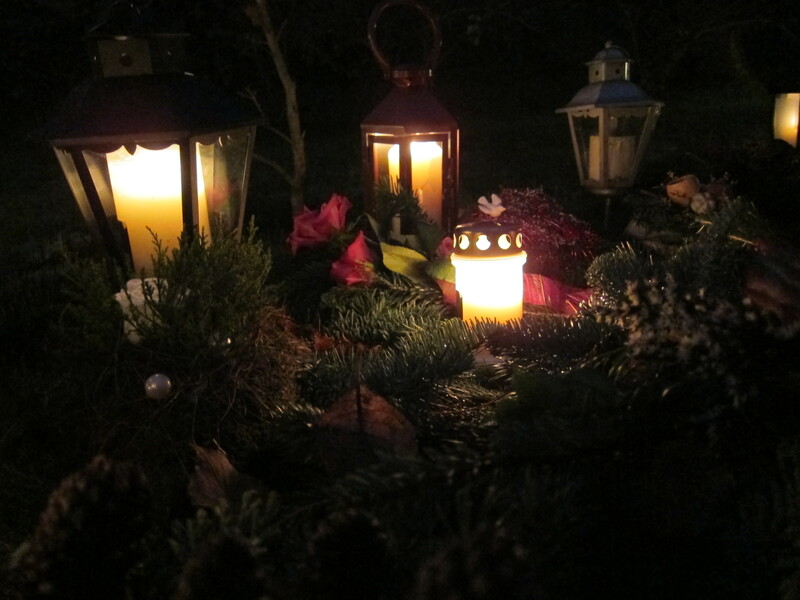 Some friends of ours told us to wait for dark and then go to any cemetery to see the candles being lit for those that have died. Now that the sun sets around 4pm, that was not too difficult for us to manage. With the setting sun, we headed to the church and cemetery in town and were impressed by the reverence and respect being honored to all those who have passed away. In stark contrast to Halloween, with goblins and ghouls running around demanding tricks and treats, All Saints Day is much more of a solemn and reflective observance. Tiny flickers of light littered the cemetery as nearly all of the tombstones and graves had wreaths laid upon them with candles lit beside them. Family members circulated the cemetery to find the graves of both long and newly deceased friends and relatives. The church bells called out into the descending darkness calling those there to remember the dead in a special service of light. My wife and I brought our boys to this partly out of our own curiosity, but also to expose them to a new holiday and observation regarding the dead. And luckily for us, we had a very curious three year old that pushed us out of our comfort zones and asked us to take him into the church. While being very respectful of all faiths and practices, my wife and I are both more disinclined to attend services. Upon K’s first request, we said no. It wasn’t appropriate, it’s not our church. But K insisted and caused us to to examine why we were saying no. Thankfully, we took the lead from our eldest son and went into the quaint church. While we did not stay for the service…something neither M or K probably could have sat quietly through, we were able to watch as the parishioners took to their pews and saw the surprisingly comforting interior of the church. Swedish design tends to be simple, which while nice is not always welcoming. But this church had a very warm and welcoming feel that took me back to the days when I too attended mass regularly as a child and my memories of stepping in from the cold outside to the warmth of the church inside. And though our visit to the church and cemetery was brief, I feel it was a good experience for all of us. The cemetery alight with remembrance. 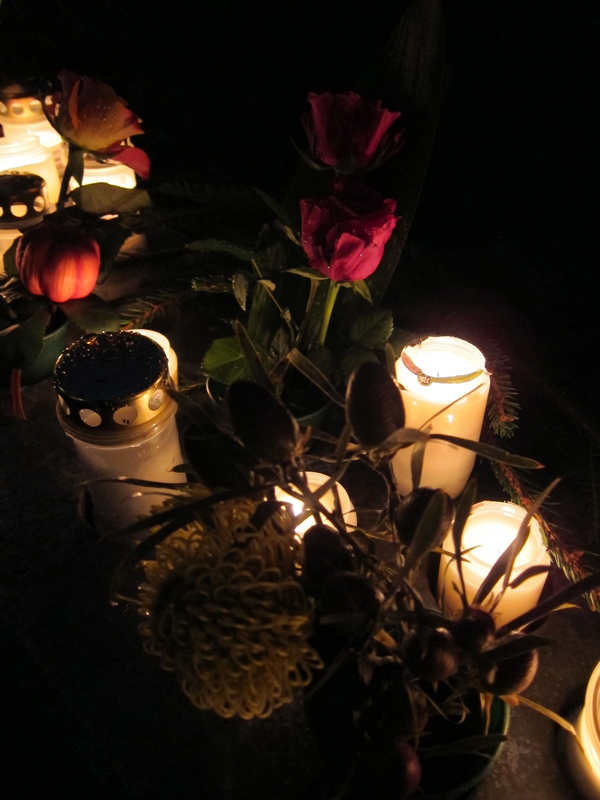 Flowers and candles adorn the graves of those whom have passed. Candles for those without graves. What a lovely day…. and nice post. Good for K for getting you guys into the thick of it too! Sometimes it takes the curiosity of a three year old to get the full experience!! Weather you go to church regularly or not some churches feel very peaceful. It sounds like this church was like that. Hope to be able to experience that feel again. Thank you for helping with that feeling. Thanks for reading and sharing your thoughts. Many houses of worship have a wonderfully peaceful and comforting feel to them, it is something good to experience. Hi there! As usual, another very well-written post. I especially love your imagery of the candlelit cemetery. But, there’s something that you mentioned in passing here, that I wish you would have expounded upon more, because it really jumped out at me leaving a giant question mark in my mind. I’d love for you to explore your thinking a bit more. So I just wonder, would you similarly try to prevent them from going into a mosque or temple, even though you’re not Muslim, Jewish, Hindu, Sikh, Baha’i, or Buddhist, ? You’ve shared the holidays of so many other cultures with your children, why prevent them from experiencing those that you will find around you now? Thank you for this comment and for requesting an elaboration on the Church part of the post. I will do my best to respond thoroughly while maintaining coherency. I understand that the majority of houses of worship are open to all and my wife and I have taken our boys to various places of worship throughout our travels. Our reluctance during this time was that a service was about to begin. 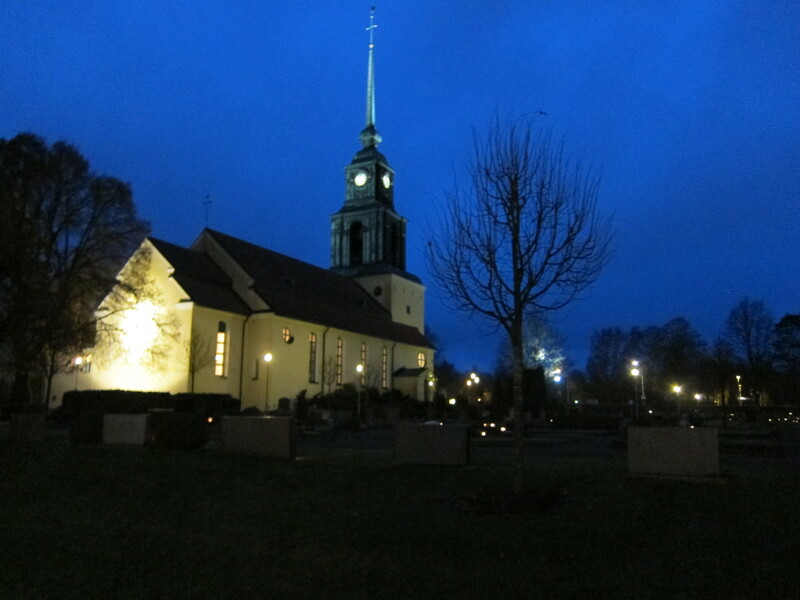 The bells had tolled and worshipers were streaming into the Church for the service of light. Typically, when there is a formal service taking place as any house of worship, we choose not to partake unless specifically invited by a friend. K is not a child well adjusted to sitting quietly or respectfully for anything for much of any duration of time, so it is best not to put ourselves in a situation where we will cause a disruption to a solemn service. Similarly, unless invited, we would not attend Friday prayers at a Mosque nor any formal prayer service held at any house of worship. I hold prayer services of any religion in high regard and do not wish to be a “tourist” as such services. When we travel and are exposed to diverse practices of faith, we do what we can to education our boys about the faith and how it is practiced…but again, K is only three and M is not yet one, so there are very large limitations. 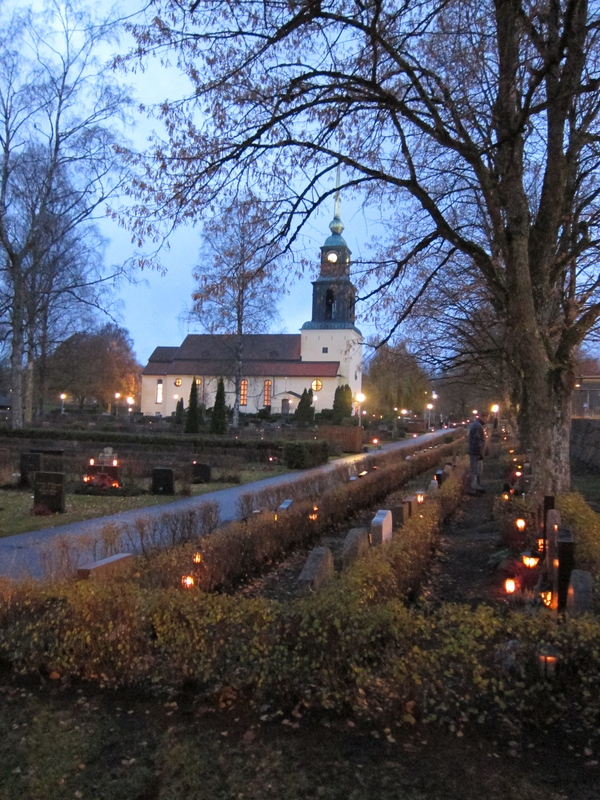 This is why we visited the cemetery in the first place, to share with them the celebration of All Saints Day in Sweden and talk about how the dead are honored here; but, we also did not want to be a disruption for the prayer services that were being held. So, we were lucky and were able to see both the cemetery with the candles lit and the wreaths laid out as well as make a quick visit into the Church so that K could see what it looked like, how it felt, and have the exposure as well.